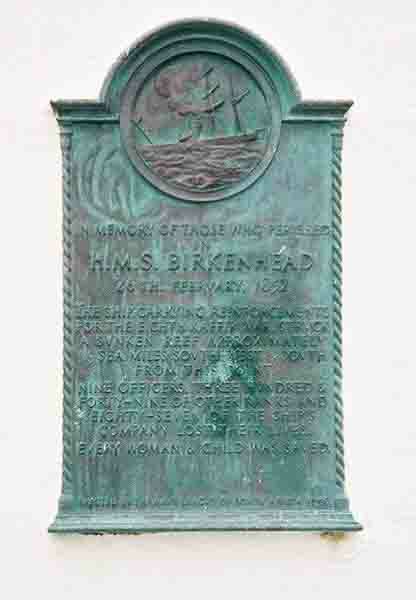 The Birkenhead is a ship that was wrecked off the coast of South Africa near Danger Point . It was a paddle steamer of 1400 tons and was launched in December 1845. It belonged to the Royal Navy and was built to be a warship. She later had a poop deck fitted and then she became a troop carrier. Many of the soldiers were sleeping below decks when the ship struck and they were drowned in their bunks, Those that managed to get on deck formed up in their ranks under the command of Lt Colonel Seton. He begged them to stand still on the deck to allow the women and children to be placed in the boats and to be taken to safety. He knew that if the troops were allowed to make a bid to save themselves they would go for the boats and many of the women and children might be drowned. As it was there were only eight lifeboats on board and only three of them were able to be launched. The horses that were on board were blindfolded and thrown overboard in an attempt to save them. Some of them swam to safety. The sharks savaged most of the horses and many of the people that ended up in the sea. 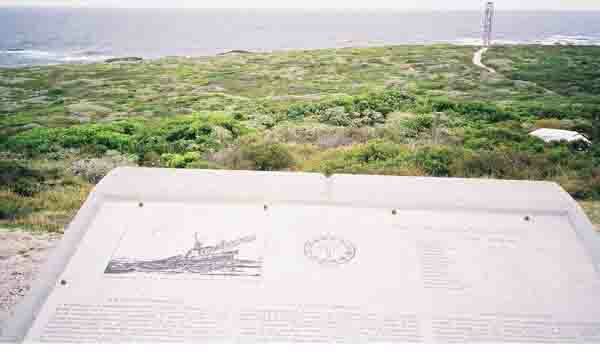 The Memorial Table at Danger Point. The groove in the centre of the table indicates the position where the Birkenhead sank out at sea. Out of the 638 people on board at the time 445 perished. Every woman and child on board was saved. It is from this wreck that the term “women and children first” came about. At the time it was reported that there was 240000 pounds worth of gold on board the ship which was to be used to pay the salaries of troops fighting in the war. When the ship went down this money also was lost. Over the years many divers have dived the wreck looking for the gold. They have found the odd gold coin which most probably belonged to the people on board ship but not the “Mother Load” . It is not sure whether there was gold on board or not but as there is a legend that there was many people will most probably try their luck in finding it. Can you imagine what that gold would be worth today?